Identification Tools Required: Magnification and darkfield lighting. Primary Test: Big and flawless will define most flame fusion rubies. These synthetic gemstones have been around for over 100 years and are available in big sizes for very little money. The most important identification feature will be the curved striations, or curved lines, that are visible in the stone when turned in the proper direction and in the proper darkfield light. What is that proper direction and proper lighting? Well, every stone is different so there will not be a definite answer to that. The key will be to remember that you will need to inspect the stone from a 360 degree sphere concept, looking from every possible direction to find any of the tell-tale curved striations. Once you find these the identification is diagnostic as there are no natural rubies that will offer this type of formation since rubies form in the hexagonal crystal system and curved growth formations are not possible. Secondary Tests: For stones in settings where a complete inspection by magnification cannot be completed there is a secondary test that can be used as a strong indicator or a confirmation test of the primary. Due to the synthetic process not using any iron, the flame fusion stone will normally have a very strong reaction to long wave ultraviolet light due to the absence of iron in the flame fusion ruby. Natural rubies are generally much more subdued to UV light owing to the effect of natural iron to limit the reaction to UV light in natural rubies. 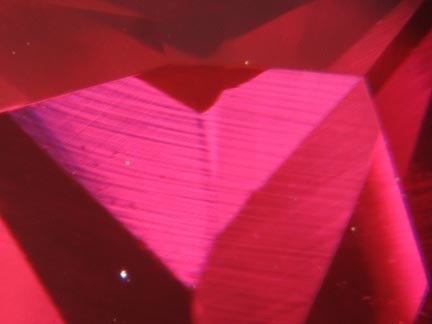 The result is that a ruby with strong fluorescence should be considered a very possibly synthetic, while a ruby with very faint UV reaction will have a tendency to be natural.....although this does not mean that no other treatments may be present. Again, this is simply a secondary test and one that should not be considered diagnostic. Repair and Setting: As a true lab grown ruby the same care should be taken as with natural ruby. Should be removed before any heat is applied. Cleaning in ultrasonic should not affect this lab created ruby.